Welcome to What's Cooking, the most popular cooking game show in the universe. Click here to play! You can win incredible prizes just be lining up the right set of food based symbols to help our expert chefs cook meals for their gourmet restaurants! Will you just match salad ingredients together and make a pittance, or can you get some steak and egg meals going for the big bucks? The cooking method is just as important, though! Stewing and steaming are fine, but having things fried can make more money, faster. When in doubt, though, be prepared to make the most elaborate dishes in the oven. Oven based meals will earn the highest price, so if you can line up 5 ovens all cooking at once, it's payday! The cameras are about to roll, so are you ready? In 3, 2, 1... Hello and welcome again to our audience at home! It's time to see What's Cooking! The chef scatter symbol pays out on the total bet. 3 symbols onscreen payout 5 times the bet. 4 symbols payout 10 times the bet. 5 symbols payout 50 times the bet. Ovens symbols are wild and substitute for anything other than scatter or bonus symbols. Also, ovens can pay out more. 2 can payout 10 times the line bet. 3 can pay 100 times the line bet. 4 can pay 1000 times the line bet. 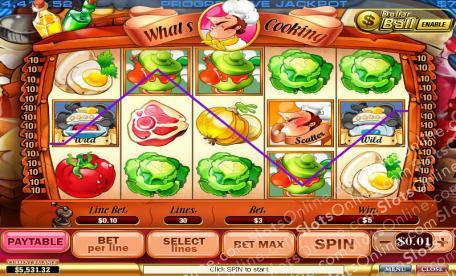 5 oven symbols payout 10000 times the line bet. Triggered by cook book symbols on reels 1 and 5. You get a choice of things that will determine the free spins you get as well as the win multiplier for those free spins.